Above the Parlour and the Warming room was the Dormitory or Dorter. It was positioned so that monks could easily walk to the church during the night for services; in many monasteries there was a night stair which linked the Dorter to the South Transept. Binham does not seem to have had one however, so that it would be necessary for the monks to use the day stairs, walk along the east cloister, and enter the church by the south door of the choir. Originally the Dorter was a long hall with straw-filled matresses in a row along each side; there was no privacy, and to save embarrassment monks would sleep in their undergarments. Towards the end of the 12th century, it became the custom to divide the dorter into cubicles, with hangings round each bed to preserve modesty. Although the dorter was situated above the Warming Room, and shared its chimney, only a background heat would have permeated the room, so the hangings must also have been welcome draught-excluders. A light was always kept burning so that when the bell rang in the middle of the night for Mattins, there would be no confusion as the monks made their way to the church in procession. The service probably lasted for an hour and a half, after which they would return to bed, to be woken again at 7.00 am for Lauds. 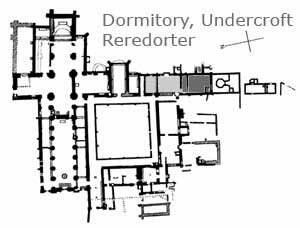 Projecting from the east side of the dorter was the Reredorter – lavatories – consisting of a row of wooden seats over a long drop to the drain at groundfloor level which was flushed from the complex draining system of the priory, (above jutting out from the undercroft wall). 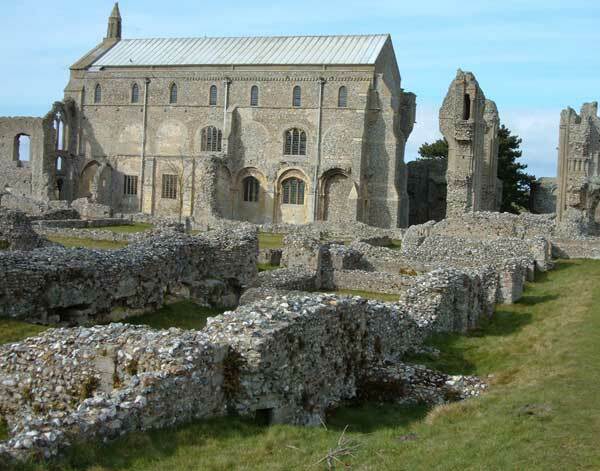 It is not certain how many of the monks at Binham actually used the dorter; the priory had been founded for 8 monks, at its height it had 13, and at the dissolution it had only 6. A priory, like any large concern, needed office-holders, who were called obedientiaries. The Infirmarer would look after the infirmary and the sick, the Sacrist provided everything necessary for services from wine to candles, the Cellarer had the task of feeding everyone from the poor stranger to the most honoured guest, and so on… All these obedientiaries had their own lodging in the priory, often in their place of work, where they might sleep and even take their meals. With so few monks and so many offices to fill, it would seem that every monk become an obedientiary; it may indeed have happened, because in 1454 Henry Halstead was made Prior on the condition that he rebuilt the dorter which had fallen into ruins!